Workers with the Three Gorges Project that is being built at the middle reaches of the Yangtze River are racing to raise dam heights at the southern bank of the river from the current 160 meters to 185 meters by May. In the meantime, the workers are requested to accomplish two more main tasks this year, namely, to complete the two-way five-tier shiplock facility built on the northern bank of the Yangtze and to prepare for the planned installation of 12 more turbogenerators on the southern bank in 2007 and 2008, according to Li. Launched in 1993, the Three Gorges Project, including a 185-m-high dam and 26 generators on both banks of the Yangtze, is being built in three phases on the middle reaches of China's longest river, the Yangtze. Preparations and construction of the first phase were carried out between 1993 and 1997. The Yangtze was dammed at the Three Gorges area for the first time on November 8, 1997. According to the plan, the completed Three Gorges Project, costing an estimated 180 billion yuan (approximately US$21.7 billion), will have 26 generators with a combined generating capacity of 18.2 million kw. Most of the construction on the northern bank of the Yangtze has been completed so far, including the 14 turbo generators, which have been installed and put to work. According to Li, these turbo generators generated 49.09 billion kw/hour of electricity in 2005. 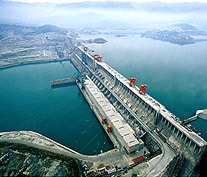 The Three Gorges Project is expected to be completed in 2009, generating 84.7 billion kwh of electricity annually.